El Día de los Muertos, or Day of the Dead, is one of the most important and colorful celebrations in Mexico. Far from a sad or scary occasion, Muertos is a festive family commemoration of loved ones who have passed on— and, as with any party, food plays a major role. Observed each year on November 1 and 2, Day of the Dead combines elements of a harvest festival with mystical beliefs of the pre-Columbian residents of Mexico and Roman Catholic beliefs and motifs from the Spanish colonizers. Fruits and crops of the season often have multiple meanings when eaten at this time and/or placed on the altares prepared by each family to welcome the spirits of their beloved deceased. 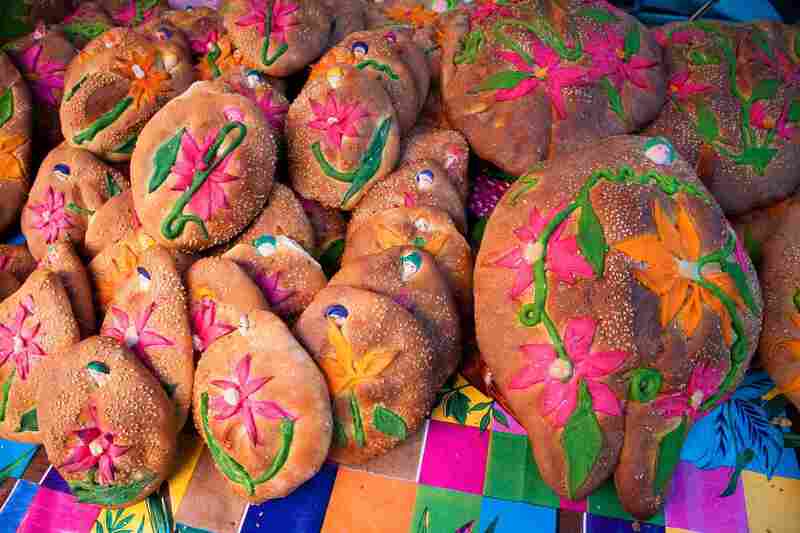 The variety of Pan de Muerto probably most often heard of outside of its country of origin is common in central Mexico and consists of a semi-spherical sweet loaf adorned with smaller pieces of dough in the shape of stylized bones and topped with a light glaze and white sugar. This sweet dish consists of cooked fresh pumpkin slices or chunks served in a cinnamon and piloncillo (rustic Mexican brown sugar) glaze. The flavor is reminiscent of the classic American candied sweet potatoes. Additional ingredients are sometimes included, such as raisins, sweet potatoes, fruits (guava is common), or the toasted seeds of the pumpkin itself, either with or without their shells. In some places, the pumpkin is not cut up or even emptied out before making calabaza en tacha: holes are drilled in several places in the vegetable and it is candied whole. The pumpkin is cut into portions before serving—seeds, stringy inside fibers, and all. Candied pumpkin is often placed on the Day of the Dead altar as an offering for the deceased while also being enjoyed by the living for breakfast, for dessert, or as a snack. A hot cup of this thick and hearty maize-based drink is just the thing to warm you up inside and out on a cold November evening, regardless of whether you are cozily ensconced at home or spending part (or all) of the night at the cemetery beside the tombs of your loved ones. Though consumed all year round, this comforting beverage is especially appreciated at Day of the Dead and during the December holidays. You will find these distinctively decorative and edible objects on almost every family’s ofrenda or offering for the dead. The skulls are made of white sugar mixed with egg whites or some other ingredient and pressed into molds. The skulls are allowed to dry, becoming hard, and then adorned with brightly colored icing as well as occasional non-edible items such as colored foil or sequins. Mountains of large and small colorful sugar skulls are sold by market vendors in Mexico during the weeks leading up to Muertos. Try a sugar skulls gallery for inspiration. Day of the Dead candy is not just limited to the traditional sugar skulls placed on family altars. Skulls, bones, full skeletons (human or animal), coffins, tombstones, and other death-related shapes—almost always comical or whimsical in tone— are made into snacks in such materials as white or black chocolate, amaranth (an ancestral grain), marzapan, gelatin (“gummy bear” style), or a fondant-like sugar paste. These range from simple flat molded chocolate pieces to very elaborately detailed handmade miniature altars made from a variety of edible materials. Creating Día de Muertos chocolate shapes is easy if you have the appropriate molds and some meltable candy coating. Since Day of the Dead is a celebration of looking back— that is, of remembering loved ones from the past—any food that is traditional to the area in which one lives is appropriate for the occasion. Mole dishes, all kinds of tamales, empanadas with various fillings, and typical sweets are all easy to find both in Mexicans’ kitchens and on their altars at this time of year. Each region of the country has its specialties which are lovingly and painstakingly prepared on different festive occasions. In this way, valuable culinary traditions are preserved and perpetuated. For this reason and others, the indigenous celebration of Mexican Day of the Dead was inscribed in the UNESCO’s Representative List of the Intangible Cultural Heritage of Humanity in 2008. So Exactly What Is Mexico's Day of the Dead? Roll Your Own - Chicken or Beef Tacos, That Is!